Welcome to the Ranua Rescue campaign! The Story: As the tapped uranium reserves are limited and today's uranium mines can't provide at least half of the fuel requirements nuclear companies like Areva are undertaking a global offense to search for new uranium mines. In Finland the French nuclear company Areva enforces their mining plans in the sparsely populated North after being driven away from southern Finland's countryside (Area 32!). 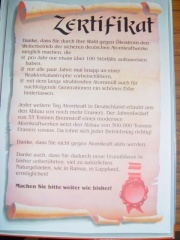 The campaign started on July 2009. In August we started an observation camp in Ranua as even the local environmental authorities couldn't tell us what methods AREVA had used in uranium prospecting. During the camp we organized an emailing campaign towards the Ranua municipality council members who where going to take a stance on uranium prospecting later the year. Tens of emails were sent to the council members from Europe, USA and Canada urging them to take a negative stance on prospecting. In 13th of August we arranged "an international action day for Ranua" with demonstrations in Helsinki, Tampere and Jyväskylä in Finland, and Berlin and Madgeburg in Germany. While the camp was up in Ranua forest we arranged info- and film-nights in Ranua concerning uranium mining. Unfortunately, despite our efforts, the Ranua municipality council didn't take a negative stance on the mining, but stated only that they don't have any legal means to prevent uranium prospecting - which is true as long as the old, totally outdated mining law is valid (untill year 2011). Anyhow, all the Ranua council members didn't agree with the outcome as 10 of the 27 members would have wanted a stronger statement against the mine. We decided to take down the observation camp in December 2009 as the Ministry of employment and economy hadn't given their decisions about the prospecting yet (it still hasn't made the decision). In the last days of the year 2009 AREVA Resources Finland dropped most of it's 108 km² prospecting site to 36 km². This was good news as the site is now on state owned land, so AREVA can't make any deals with private landowners as it has done earlier. This remarkably smaller area is also easier to keep an eye on. We will continue the campaign in Ranua. The local activists are keeping an eye on the area and Ranua Rescue will go back when needed. Ranua Rescue is a campaign opposing nuclear power company AREVA's plans to prospect and mine uranium is Ranua, a municipality in southern Lapland, Finland. With the campaign we want to stop the uranium prospecting and bring attention to this less known but even more destructive side of nuclear power. Ranua Rescue is independent from political parties and NGO's, not committed to any special political ideology or religion. The participants agree that there should not be any uranium mines in Ranua or anywhere else. An uranium mine leaves the nature devastated for forever, seriously threatens the health of local inhabitants and destroys many other sources of living. The Ranua Rescue campaigners can have disagreements about other political questions and world views. Marketing political parties or other organizations is not allowed within the campaign. As an international campaign we want to highlight that we don't oppose AREVA only because from Finnish point of view it is a foreign (French) company. The damages uranium mines cause are of the similar type not depending of the nationality of the company, country or the people. Tens of people from all around Finland and several other countries have taken interest of the campaign as there is people all around the world fighting the same problems and even the same company. We in Ranua Rescue campaign accept non-violent civil disobedience as means to protect the people and the nature in situations when law doesn't protect them. Become Ranua Rescue Facebook friend! Become a reader of our blog! Check news and info in http://www.ranuarescue.blogspot.com. It's a bilingual blog (Finnish / English) and some of the documents and news are in Swedish, French or Spanish. Take part on the campaign! Take part in the "rapid action force". If AREVA starts working on Ranua, the idea is to stop them with civil disobedience if needed. Send email with subject "ALARM" to ranuarescue AT gmail.com. In Ranua the soil and groundwater are in danger of being contaminated by uranium prospecting and mining. On November the 16th 2009, the municipal council of Ranua will give their final stance on the prospecting. The stance will most likely be positive unless an action is taken to turn the municipality board members' minds: the Center Party (KESK) members have made a binding group decision to vote yes for the prospecting. Now it's the time to put pressure on them and to let them know that they are being observed all around the world! In Ranua - a municipality located in Lapland, Finland - the soil and groundwater are in danger of being contaminated by uranium prospecting. Let Areva and the municipality's pro-uranium mining politicians know that they are being observed all around the world! An uranium mine in Lapland would lead to all the people who now get their livelihood from berry or mushroom picking, collecting wild plants, reindeer herding, fishing or agriculture to lose their source of income. Mining and radioactive waste in the vulnerable northern nature would also destroy Europe's largest remaining wilderness areas for forever. In many countries people and companies are watching Finnish policy on nuclear energy and uranium mining to see if it starts a new trend on nuclear energy. So this is not only a local issue but important to all the people in Finland and other parts of Europe/world! Send an email, call or fax the council members (see contact data of council members). Write or call to one or more (or all!) municipality board members. You can do it in English or your own language (if not in Finnish or Swedish). Tell them that you are worried about the situation. Urge them to say NO to uranium prospecting. Add at least one reason why you think they should not allow uranium prospecting in the area (for help with your letter/mail/call see the text "more info" below). You are welcome to also BCC your emails to ranuarescue AT gmail.com. On the 1st of September 2008, Areva Resources Finland Oy submitted their application for a mining claim in the area of Asentolamminoja, on the border between the Ranua and Rovaniemi municipalities, to the Ministry of Employment and Economy. Before any decision or approval of the application, the company started digging in preparation of test drilling in November 2008 in the southern end of the area, at Isokangas, with the permission of the land owner. 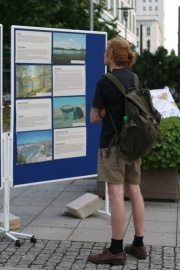 In August 2009, the municipal board of Ranua gave their supporting stance on the mining project. Local people opposing the mining fear that Areva will start the test drilling when they want. According to law, the company should wait for the claim approval from the Ministry of Employment and Economy. On the claim area there are several marshes and small waters that are connected to the groundwater reserves. The area is part of the watershed of the Simo river (i.e. the water flows to the river), which is designated as a NATURA2000 area. If the claim goes ahead, there would be in total over 10 kilometres of drillings and they would extend below the level of the groundwater reserves. If radioactive ore gets in contact with the water, the consequences are likely to be fatal both for the area's groundwater and for the Simo river. 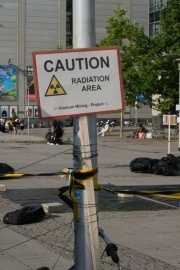 The Geological SurveyCentre of Finland, who is participating in the prospecting, denies the existence of the risk, despite the fact that spoiling of the groundwater has often been a direct consequence of uranium prospecting elsewhere. Around the world, uranium mining has resulted in extreme environmental destruction. In Europe it has been abolished precisely because of environmental problems. AREVA, the company active in Ranua, is responsible for, among other things, enormous environmental destruction in their mining regions in Niger, and in France for the algae-based processing of mining tailings (i.e. leftover rock & sediment), which created a public scandal. In Finland, AREVA is also building the new (EPR) reactor in Olkiluoto, which has turned into a fiasco. Ranua-based activists have tried to inform the decision-makers and municipal inhabitants about the problems of uranium mining. They have collected names for a ban on uranium mining at different events, written to regional papers and arranged informational events, among other things. However, a local civil movement has quite limited power of influence, when put against the massive lobbying machine of the uranium power industry, and the state's energy policies, that favour mining in northern Finland. The "No Uranium Power!" camp in Tervola, in July 2009, was visited by people from Ranua opposed to the mining, who asked for support from the anti-nuclear movement. In the workshop that followed the visit, people wanted to start broad nationwide and international activity in support of the people from Ranua. In this situation of emergency, all available methods should be used to stop the project. We call everyone concerned by the issue to act! We will show a film for the start of the evening. Afterwords there will be music and slide-show during and/or between the bands. (official side) Exclusive (!) info night for the members of the municipality council on October 14th, 2009 in order to help them to vote about the uranium prospecting. There will be representatives from the Lapland environmental centre, STUK, TEM, 'Lapps against nuclear power' and Areva. The film Area 32 is about the fight against uranium mining in Askola, south of Finland. The people won the fight in 2007. Ranua Rescue started as local activists from Ranua and other people interested in Finland's nuclear power situation met in a camp "Ei uraanivoimaa / No uranium power"-camp in Tervola, neighborough municipality of Ranua in summer 2009. The activists in Ranua had already done a lot opposing AREVA as the company applied for the permission for uranium prospecting in September 2008. Unfortunately many decision-makers in Ranua are only interested of the few jobs and the money the mine would bring to the municipality, not taking into account that the mine would destroy much more job opportunities than it would bring. Many people in Lapland are depending on the nature (berry-, herb- and mushroom picking and reindeer herding) and tourism for living. An uranium mine would destroy the nature and would not be an attraction site for tourists either! The neighborough municipality Tervola, for example, had chosen to strongly oppose uranium prospecting plans. A mine in Ranua would also effect on the whole Southern Lapland, as many of the streams from AREVA prospecting site leads to the longest (193 km) free river of Finland, the Simo river, which runs through the whole Southern Lapland all the way to the sea. A leak in the tailings dams in this marshy area would spread the radioactive pollution to a really large area. The Ministry of employment and economy hasn't made a decision about Ranua uranium prospecting yet. They might be waiting for the Finnish Parliament to vote on building more nuclear power. The vote takes place probably on June 2010. A positive decision for building more nuclear power would definitely encourage the uranium prospecting and mining projects. Unfortunately there are also other, even more proceeded uranium mining projects in Finland than in Ranua. But as Ranua Rescue's resources are limited we are not able to effect on the other projects the same way. We hope that spreading information about Ranua and uranium mining in general will effect on the other projects in Finland and worldwide, and at the same time bring more resistance against uranium mining and the use of nuclear power. No more destruction of nature and health with uranium mining! Old barrel in a lake by Ranua - that's the bad way people treat nature! This page was last modified on 16 December 2015, at 17:41. This page has been accessed 93,848 times.